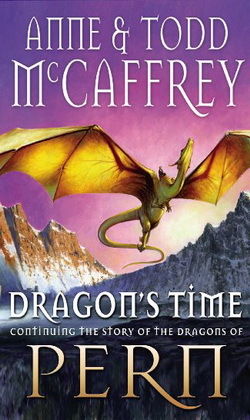 In all this, Dragon's Time matches Todd's Dragonheart, two books back. The differences: It is now six months rather than a few weeks after the start of the Third Pass. The refuge is in the near past, but distant in space: the smaller and unknown Western Continent (as readers of the series know it), on the other side of Pern from the settled Northern Continent. There is a secondary purpose, or opportunity: both humans and dragons may reproduce (the childbearing of leading women is a theme). Fiona and the temporary Weyr she leads compose a smaller part of the story than in Dragonheart. She shares the lead, and often her queen dragon Talenth, with Lorana. Lorana was the protagonist of Dragonsblood, Todd McCaffrey's first solo effort, three books back, but ending early in this year 508. She is the expert time traveler, who led Fiona and others on the backward journey in Dragonheart, and risked the first forward journey at the end of Dragongirl. In this book she makes many short-duration trips, some of them distant in time. "You can't break time, but you can cheat it", and Lorana is the expert cheater.